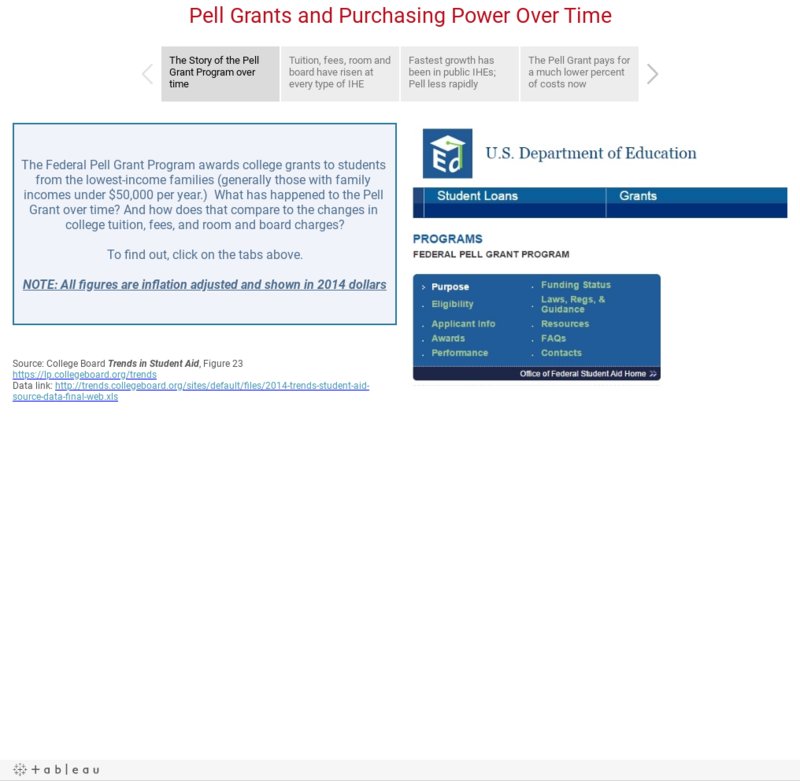 Higher Ed Data Stories: What is the Pell Grant Worth? What is the Pell Grant Worth? The Pell Grant got its start as the Basic Education Opportunity Grant, or BEOG sometime in the 1970's; it was later named for Rhode Island Senator Claiborne Pell. The idea was simple: To provide a basic level of financial support for students from low income families who aspired to go to college. It's almost certainly had a lot to do with increased levels of educational attainment in America, but rapid tuition increases, coupled with lower increases for the Pell, means the gap between Pell and tuition has gotten bigger over time. The College Board has complied a lot of good data on this and other financial aid trends in its report, updated annually, on its Higher Education Trends site, where you can download the data. Unfortunately, the data looks like this when you get it. Maybe you can extract the insight; I can't. So I pulled it into Tableau and spent an hour or so with it to see what I could find. It's below. The College Board has calculated enrollment-weighted average tuition by type (4-year public and 4-year private, not-for-profit) which makes comparisons easier, and has adjusted everything (including the maximum Pell Grant) for inflation. 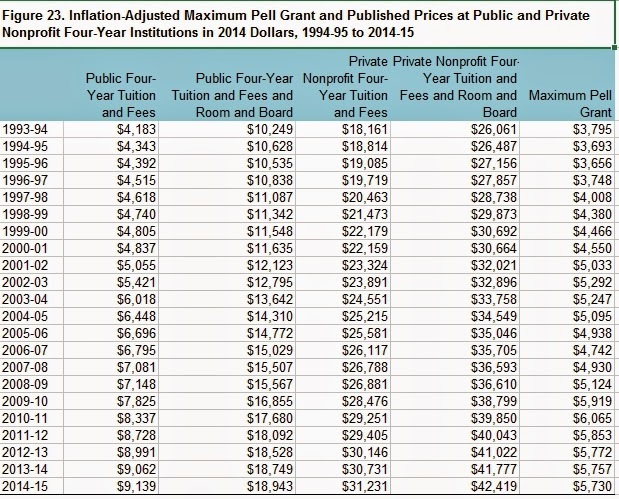 You can see on the three views what's happened to tuition, fees, and Pell; how much they've changed on a percentage basis; and the purchasing power of Pell over time. Occasionally (OK, frequently) I've criticized highly selective institutions for enrolling very low percentages of Pell Grant students in their freshman class. If you wanted to argue that they don't make much business sense, you might have a point. But you'd also be right in pointing out that the diminished purchasing power of Pell is due in large part to rapid increases in tuition. So there's plenty of blame to go around.